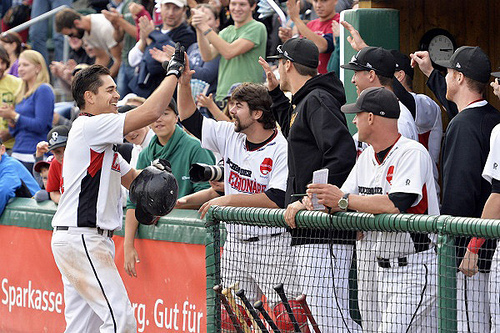 Defending champion Buchbinder Legionaere Regensburg tied the best-of-five final series in the German Baseball-Bundesliga 1-1 with an 8-6 victory over the Solingen Alligators on Sunday afternoon. Regensburg built an 8-0 lead through eight innings in front of 1,228 people at the Armin-Wolf-Arena and then had to fight off a late comeback push by the Alligators in the ninth. Justin Kuehn’s performance on the mound was key to the win. He kept the northern champion scoreless until a leadoff home run by Kai Gronauer – his third in four playoff appearances for Solingen – in the ninth. Overall he gave up only one run on six hits and two walks in eight-plus innings. Solingen’s biggest threat besides their late rally came in the fifth. Dominik Wulf and Florian Goetze opened the frame with back-to-back hits to put two runners into scoring position. But Kuehn induced David Selsemeyer and Robin Drache into a flyout and a groundout to third. After Moritz Buttgereit walked to load the bases, Tanner Leighton grounded out to Kuehn to end the inning. Meanwhile the Buchbinder Legionaere offense came through against Nick Renault (8 IP, 15 H, 8 R, 7 ER, 6 BB, 2 SO), quite possibly the best pitcher in the Baseball-Bundesliga this year. Enzo Muschik and Evan LeBlanc gave Regensburg a 2-0 lead with RBI singles in the second and the third. Matt Vance extended the advantage to five runs with a three-run shot in the fourth. They added three insurance runs later, two on doubles by LeBlanc and Ludwig Glaser. The Alligators looked like they were clearly on the losing path. But Gronauer gave them new life with a solo home run in the ninth, chasing Kuehn from the game. Against relievers Jonathan Eisenhuth and Daniel Thieben and with the help of an error by first baseman Maik Ehmcke they put five more runs on the board capped by a sac fly by Gronauer. Philipp Hoffschild came in and needed to shut the door. He walked Dustin Hughes to load the bases with two outs, but got Wulf to fly out to right field. The Alligators had won the first game on Saturday by a score of 6-5, building a 6-0 lead before stopping a Regensburg rally in the end. Games three and four will be played in Solingen next weekend. Legionaere TV is broadcasting all five games of the German finals. Games one and two are available as video on demand.